Who is at the top, anyway? At this point in the year, there is a clear top tier in the NCDA. Grand Valley State and Towson have distanced themselves from the rest of the pack as we head into mid-November. Towson has stormed their way to 15 consecutive wins to start the season, outpacing Grand Valley by a large margin in win-total. GVSU, on the other hand, stands at 7-0, with almost all of their matches coming against tough in-state competition. Not much to really gather from this info. All of those games have been blowouts. In fact, neither GVSU or Towson has really played a match that has come down to the wire. Each team only has one win by less than a two-point margin, and those were both matches in which they had control of the contest for essentially the whole game. Bottom line, Towson and GVSU have proven they are in a class of their own right now. While it would be epic for both teams to remain undefeated all season and meet in the national title game to determine who is the best team in the country, I have a feeling we will see these two squads face off at an event or two during the winter. When that day comes, the college dodgeball world will have their eyes peeled to Facebook Live to find out who in fact is the best team in the nation. 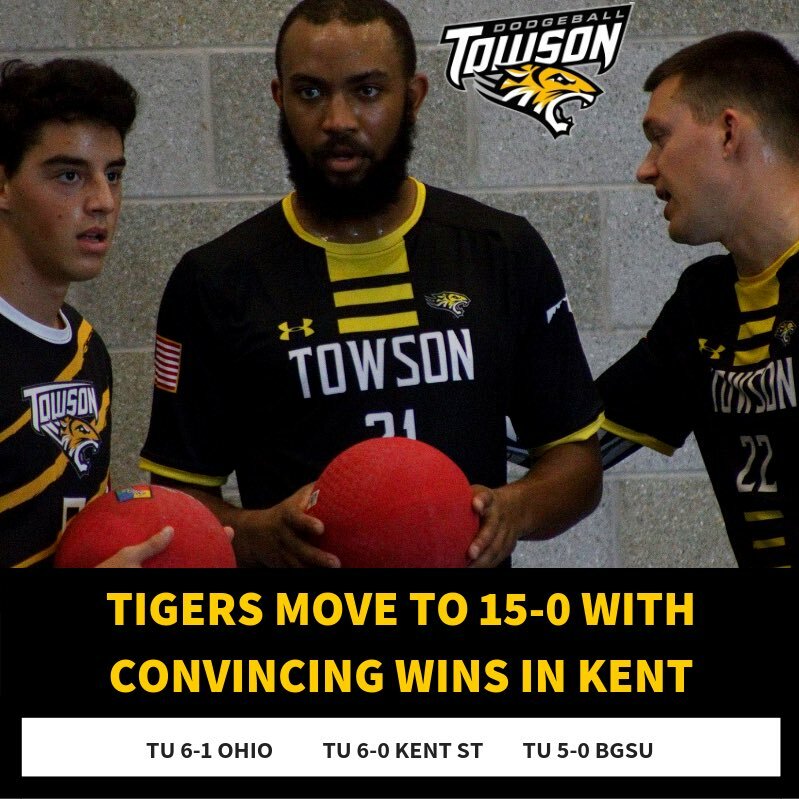 The Towson Tigers hold a 15-0 record through mid-November, including dominant wins over JMU and Kent State. If GVSU and Towson are the top tier, who’s next? While it’s fun to have the argument over who is the best team in the nation, the real questions are for the next tier of teams. James Madison has shrugged off the early season loss at the hands of Towson to have quite a solid fall semester. The Dukes would be the #3 team in the country right now if it were up to me, thanks to their performance at the Grand Valley Gauntlet. Despite blowout losses to both GVSU and Towson, James Madison has put together a solid resume this fall, earning wins over UMD and UVA on the East Coast, as well as MSU, SVSU, and CMU in Michigan. Those three wins over the three Michigan teams not named Grand Valley really is the part. The Dukes proved they have the talent to travel across the country with a roster solid enough to take down three of the four Michigan schools. JMU is poised for a strong winter/spring. It get s a bit foggy after #3 for me. Central Michigan had the best case for the #2 spot in Michigan prior to the Gauntlet, but at that event they were beat 4-3 by MSU and 4-1 by JMU. Saginaw Valley State on the other hand, has a 1-2 record against Central, but according to GVSU Coach Dylan Fettig, seemed like a deeper and more prepared team at the most recent Michigan tourney: the Grand Valley Gauntlet. Keeping it in the Michigan Region, Michigan State remains on the outside looking in for a spot in the top 4 right now. The Spartans have shown some signs of life, don’t get me wrong. I fully expect them to turn the corner in the near future, and they already seem to be getting close with a very competitive game with JMU at the Gauntlet along with a big time victory over Central. The issue for the Spartans right now is they need to get more wins on their resume after going 0-4 (including a loss to Kentucky) at the first tournament of the year. MSU will very much be in the conversation for a top 4 spot in the winter, but they have some strides to make before that occurs. Heading outside of the Michigan Region, there are two Ohio schools who certainly can make a case that they are top 5 material. Kent State and Miami are both having solid seasons, and they stand 1-1 against each other. The make or break factor for both of these teams is how they compete with teams from outside the Ohio Region, particularly teams inside the top 10/15. It hasn’t been fantastic in that regard so far this season for Kent State, as they have lost twice at the hands of Towson by a combined score of 8-2. This weekend at the Spartan Invite, both squads will have the opportunity to increase their argument for a top 5 spot in the nation. The schedule lines up perfectly for each team to make a huge jump in the standings if they have a great day. Miami will face off with MSU, GVSU, and CMU, while Kent gets GVSU, MSU, and SVSU. Which region is the best? Or, which region has the best depth? In my opinion, the answer to that question currently is: East Coast. While I love the growth/depth in the Ohio region, I believe the East Coast is a bit ahead of them right now. 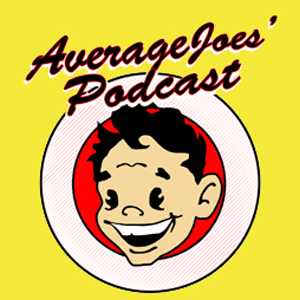 Okay, let’s try to talk about everyone else here. 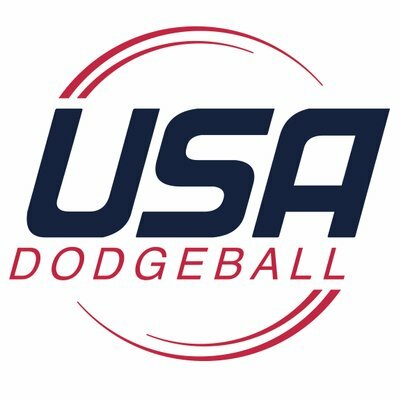 Outside of the “Big 3” regions (Michigan, East Coast, Ohio), there is still a lot of dodgeball being played. The standout non-Big 3 teams so far this year are: UNG, UK, UNL, and UWP. I’ll start with UWP. I love that this team continues to test their limits with the amount they travel and the tough competition they choose to go up against. This weekend, they travel to East Lansing for the Spartan Invite. That will be a great growing experience for a team that so far this year has admittedly not reached expectations. Keeping it in the Midway Conference, Nebraska is a team that has certainly exceeded their preseason expectations. Beating UWP twice in a doubleheader is the type of boost a program can really use as a stepping stone. The Cornhuskers have not taken those wins and decided to be content though. Instead, UNL has made an effort to test their skill against other teams throughout the country. Nebraska made it out to Akron for Pinkout, and had plans of attending the Grand Valley Gauntlet before that fell through last minute. Overall, I would say it’s been a solid season so far for UNL. On to the South Region, UNG proved to everyone they are the top team after their performance against UK last month. Kentucky meanwhile, has had an up and down year; their biggest win in the first tournament of the year against Michigan State. Outside of those four teams, Georgia Southern is one more squad worthy of a shoutout. Like UNL, this group has been willing to travel in order to compete with teams across many regions. GSU has put together a couple wins this fall, and if they continue to improve, we might see them earn a solid seed at Nationals.